We’ve all been there. He does something stupid; she says something mean; he forgets an important occasion; she isn’t “in the mood” enough. If you’re married and live under the same roof as your spouse, you’ve had a few really good arguments. If you say you don’t, you’re totally lying, and that’s a bad, bad thing (Revelation 21:8). 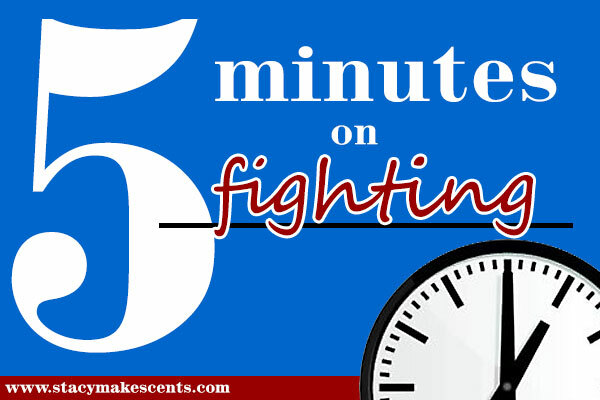 This week, Stacy and I take five minutes to tackle the subject of how we fight. Why do we argue? What things do we argue about? Where do we argue? How do we make up? I’m not a marriage counselor, but in my journeys doing financial counseling, I can tell you that most fights are over stupid things and are truly petty. How do you deal with it? Today, we find out. Stacy and I have spent many hours “discussing” some topic or another and usually, after it is over, we realize how dumb it was to be arguing about it. But why do we argue? Why do couples fight? Here’s our take. What about you? Why do you fight? Any tips from those of you who have been married a while on how to get over it? If you haven’t already, you should check out our other “5 Minutes On ____” topics: Five Minutes on Chores and Five Minutes on Marriage. We’ve been married for twenty years next month. We don’t fight because we’re both non-confrontational. I’m learning now to say my thoughts and opinions, but it’s really hard!! The problems are there that need to be addressed, they just aren’t. Sad, huh? What about when your husband is in a bad mood over work or family issues and ends up fighting with you over stupid stuff… any suggestions? We both end up so mad we don’t talk for a few days… I hate fighting! Usually if Barry (or me) is in a bad mood, we try to distance ourselves from each other until we mellow out. When I’m in a bad mood, I usually can resolve it after a few minutes alone. A lesson I’m trying to learn as the role of wife is being submissive to the husband as the Bible commands us to do until I looked at it like “do i want to be responsible for making big decisions? NO” lol…because our bigger fights would be around major decisions. I let him know my opinion, but ultimately it’s his decision. we tend to bicker a lot, but its mostly over little things like how to load the dish washer properly..hehe…what really helps us is neither of us can stay mad long. I’ve discovered over 10 years of marriage a lot of time it’s over totally misunderstanding each other. Like he said one thing, i thought he meant another thing etc, if you take the time like you said to talk and clear things up it really helps. ALSO I’ve learned with him that I can’t expect him to get anything by implying. I have to be very exact such as instead of saying, i didn’t have time to load the dishwasher and I’m tired because i was up a lot with the baby, i have to ask him directly to load the dishwasher, etc. Like you said talking is key. YES!!! Be direct. I have to spell it out sometimes. I love how REAL ya’ll are in these videos! Well, in the blog as a whole, really. I never get the impression that either of you are trying to impress your readers, or make it seem like ya’ll are better than us. Does that make sense?? I like knowin ya’ll are just like the rest of us, imperfect! ( : My husband and I have been married for 4 years. We fight a LOT (though thankfully less than we used to – I guess we’re learnin!)! Though I can’t say we really fight much over petty things. We don’t fight over what TV show to watch, what to eat, etc. On the other hand, we don’t fight about important things like how to raise our child, either. The majority of our fights start because he’ll be tired and ill from work when he gets home and will say something out of the way to me (and I’ve also been at work all day, so I’m usually tired too) and I will take it personally and get mad (instead of reminding myself that that’s just how he lets off steam, and he doesn’t mean to be mad at ME). I’ve actually gotten much better about not flying off the handle at him and just ignoring him until he’s calmed down, but its still hard when I’m tired and stressed, too. Why is it so easy to lash out at the person you love the most?? We’re still learning how to best “get over” our fights. He will be over something 10 minutes after a huge fight. Me, I take a little while to calm down and quit seeing red, haha. I am happy to say that I am MUCH better about getting over things now. I understand my husband SO much better now than I used to, and that has helped tremendously. Funny thing about the word “fight” though. I was talkin with my grandma about this a while back, and she was appalled that my husband and I “fight.” She thought I meant we beat each other up!! LOL! We were well into the conversation before I realized why she looked so horrified. I quickly explained that “fighting” is just using words – no physical violence! Before we got that cleared up, she told me her and Papa never fought, which I found very hard to believe. Turns out she meant they never physically fought – that was good to hear, haha! Love this! My hubs and I have been together for 8.5 years and married for 4. We have disagreements occasionally but very rarely, and I mean VERY rarely do we get upset enough to call it a fight. I wouldn’t say it’s because we don’t communicate because we do but we don’t like dissention so we diffuse the situation before it get too upsetting. This was a great video Stacy! Love getting the perspective from Barry as well. I grew up in a house where my parents never fought. Nobody believed them, but they hated confrontation, so what actually happened was that they didn’t communicate, like you said in the video! So naturally I get scared to fight with my husband. We do fight though, we are both hard headed first borns with control issues, so it can get really ugly. I am trying to learn how to confront with love and not be hurtful with my words. If you have anything to say on that subject, I’d love to hear how you two resolve your fights when you don’t want to talk about it or just want to tear the other person up! Our fights are usually bout him saying no. He has a momma who requires assistance & he’s always been the primary caregiver but he’s running himself to the ground. He Just Won’t Ask for help. And the family takes advantage. ooooooh! gets me going! Great post. Thanks for the honesty and opening up for the world. Btw, was the brownie THM? Of course. 🙂 It’s a lifestyle don’t ya know. Are you both first-born children? I find my husband and I have power struggle issues partly because we are both first-born. How it was described to me was whenever you fight it should teach us the gospel that much more. We should remember if we did “what we are mad at our spouse for” to Jesus. Are you mad because your husband forgot something or was insensitive? Did you ever forget or be insensitive to God? Yep. And the Lord forgave us of everything without holding grudges and pouting or making us “pay” for it, so we forgive the same way because we did that or WORSE to our Savior. This isn’t original information because I’d happily hold a grudge, pout, etc. I listen to Drive by Marriage from wretchedradio. It’s only the gospel that can change a heart! Love this new video about “How we fight.” 🙂 How do you not fight about money? Are you so in tune with each other and your budget that there are no issues when it comes to money and how you spend it? That’s where most of our fights are about. I love it! Thanks for keeping ot real. 🙂 You’re a fabulous couple!